Last weekend, like millions of others overcome with Kondo induced hysteria, I dutifully gathered all the clothes from my wardrobe, the hall cupboard and the spare room and laid out a material mountain on my bed. Just as Japanese de-clutter Queen Marie Kondo dictates in her book and recent Netflix show ‘Tidying Up’. The purpose of this is to fully appreciate just how many patterned sun dresses you own and don’t wear. Or that’s how it felt when I stared at the bulbous pile overwhelming the bed. The next step, according to Kondo, is to pick up each item and decide whether or not it ‘sparks joy’. So I grabbed the first Country Road knit atop the pile with both hands, ready for the material to transfer a spark of feeling through my skin and up my arms and into my heart… and I felt… nothing. I picked up the long printed wrap-dress I wore to my sister’s wedding… nothing… A black strapless Natasha Gan cocktail dress I bought on holiday in Bali… nothing… a simple blazer from Zara… nothing. This continued until I picked up a white Uniqlo tshirt, visibly stained that sickly yellow/grey from deodorant, and felt revulsion. Somewhat miffed about the hollow absence of joy, I sorted my clothes until I had four large bags straining to contain my discards. Those bags were promptly transferred to my car and then I sat down, exhausted from the process and overwhelmed with naked coat hangers. During the week, items from the car slowly crept their way upstairs, into my apartment and onto my body. The grey summer work dress carelessly tossed aside just days prior might not spark joy, but it was my only summer work dress. And while ‘joy’ is probably a stretch I was certainly happy that throwing it on my body meant one less decision I had to make that hurried morning. I realised that asking my clothes to ‘spark joy’ was a tall order. For me, ‘joy’ is the highest experience on the totem pole of happiness. I feel joy watching my brother’s dog zoom along the beach, tongue flapping in the breeze. I feel joy when my mother, sister and I are paralysed with laughter over something as trivial as the absurdity of the Korean skincare sheet masks sliding down our faces. When I’m dancing in the car with my friend-since-year-10 on a ‘road trip’ to Melbourne’s outer sprawl. When my friend’s son, who has already captured a hefty chunk of my heart, breaks into his toothless grin. But standing in my spare room, clutching yet another stripy long-sleeved top? Completely joyless. I do believe in the joy of owning less and spending money on experiences over things. This is well evidenced by that time Andy and I sold everything to travel for 16 months. Sure, I like to shop and I enjoy having something new and fun to wear but I think it’s more important to reign it in at the purchasing end and not the purging end. Some clothes serve an important, albeit boring, function of guarding against public nakedness. A minimalist wardrobe that gives you grief every time you need to dress in a hurry won’t spark joy. Also, the way our capitalist society functions is on the premise that objects diminish in perceived value over time, which is why we’re always upgrading our iPhones. So asking clothes to ‘spark joy’ could end in a revolving door of buying and purging. 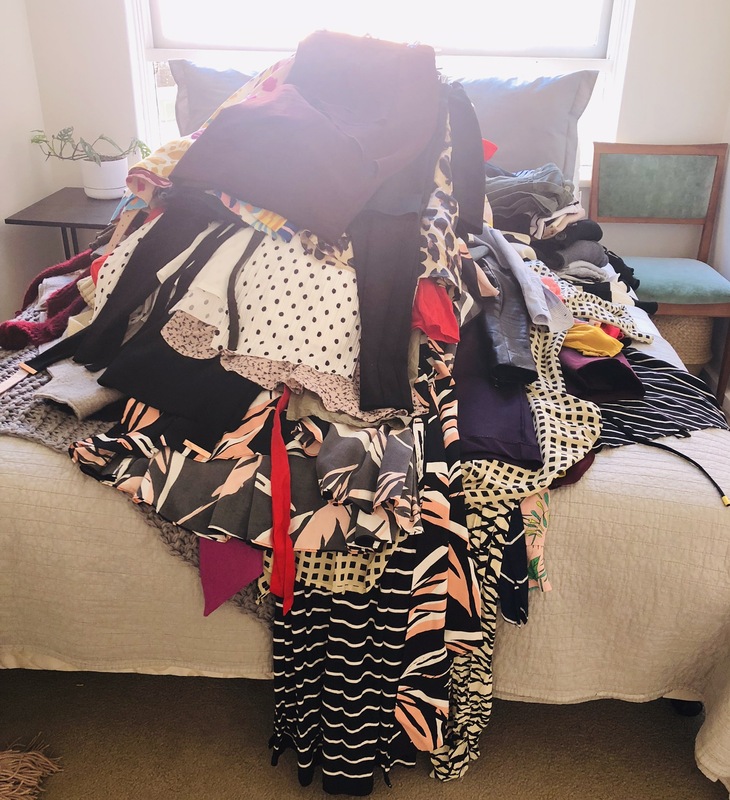 Our charity shops are already overwhelmed with Kondo inspired ‘joyless’ clothes, and what to do with the excess is another blog post entirely. So I’m not going to feel guilty about allowing some discarded items back into the house, if they’ll come. The joyous experiences I’ll have in my joyless clothes is good enough for me. This entry was posted in Misc, Social Commentary and tagged Clutter, Decluttering, Social Commentary. Bookmark the permalink. I couldn’t agree more. I saw a meme on FB the other day that said something along the lines of, “if I threw out everything that didn’t spark joy, I’d be huddled on the side of the road with my dog and coffee maker”. Although I’d only have my dog because I don’t own a coffee maker. I have not watched the show or read the book because I knew it would be wasted on me. I am a born minimalist, generally, having too many things actually stresses me out in the first instance. When it comes to clothes, I usually invest in good pieces of clothing that make dressing easier, with a few fun things for good measure. I then wear them all to death until I am forced to buy more, so there is really nothing to throw out unless I want to end up naked at work / in public. I’m so glad that you wrote this, well said!